In celebration of the victory by the great galactic overlord Thanos, the SP19 contest is MAE3: ENGAME!!! Half of MAE 3 will be eliminated in each round of this galaxy crushing competition. Gather as many Infinity Stones as possible in your gauntlet to survive! MAE 3 students will design robots to gather six Infinity Stones (plastic gemstones) scattered both in hiding and in plain sight across the galaxy (contest table). As the difficulty of scoring increases, the point value also increases! The six Infinity Stones wield incredible power that few beings can harness, and anyone who wields all six at once can destroy half of all life in the galaxy. Earth’s mightiest heroes, the Avengers, have attempted to prevent this from happening by scattering and hiding the Stones. To defeat these puny humans and to impose your will on the galaxy, you must find and place the six stones in the Infinity Gauntlet! Here, MAE 3 students have been tasked with creating robots that will challenge each other for dominion over the entire galaxy. Two robots will compete head-to-head for sixty (60) seconds. Robots will try to score as many Infinity Stones as possible in either the spaceship on the table or in the Infinity Gauntlet elevated above the back corner of each side of the table. All scoring will be done at the completion of the contest after all parts have finished moving. BONUSES: Scoring the Mind Stone is worth two (2) additional points. Scoring the Soul Stone is worth five (5) additional points. Note that only the highest value stone per cup on the gauntlet will be counted. For example, if you score both the Time Stone and the Mind Stone in the same cup of Zone B, you would get 2 points for scoring one gem in Zone B plus 2 points for the Mind Stone bonus, but you would NOT get points for the Time Stone. If the two are in different cups of Zone B, you would get 4 points for scoring two gems in Zone B plus 2 points for the Mind Stone bonus. Robots must fit entirely within a 10x10x10in starting box at the start of the competition, but can be located in any position within the team's half of the field so long as no part of the starting box is touching any object on the contest table (including the side walls and any of the gemstones) when placed over the robot. In the event of a tie, the first tiebreaker will be possession of the Mind Stone (yellow gem). Whichever team has the Mind Stone on its side of the table will be the winner. Note that the Stone does not need to be scored in the spaceship or in the gauntlet to act as a tiebreaker. If the Mind Stone has not been dislodged from its starting position, then the second tiebreaker goes to the team who scored more gems in the highest point location (for example, one gem in the top of the gauntlet beats three gems in the bottom of the gauntlet). ● Robot setup time on the contest table cannot exceed 2 minutes. ● Manufacturing variations will exist between playing fields. 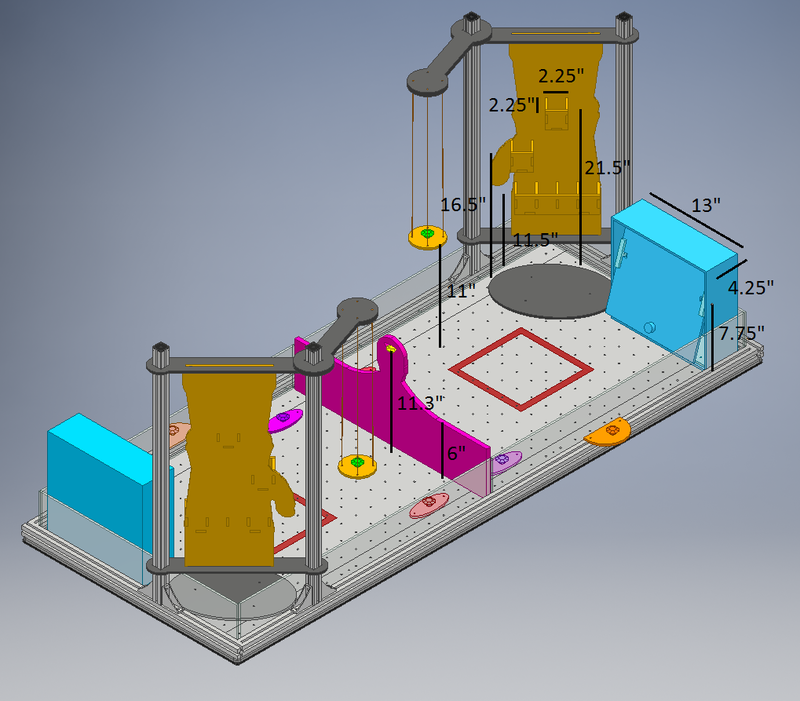 It is the team's responsibility to design a robot that will work on all contest tables. ● Each robot must only be built out of kit parts provided. ● Robots must be built in the Design Studio only using Design Studio tools. ● The disassembled robot must be able to fit in the team's locker, where it must be stored. ● Robots may be designed to interact. However, it is not in the spirit of the competition to intentionally damage another machine and no part of the kit may be used in a manner that is intended to cause harm. Any device which is designed to chop, break, or penetrate another machine will not be allowed to compete. If you think your machine may be at risk for violating this rule, ask early before you build it! o Applying forces onto an opposing team’s robot that are large enough to break plastic parts, while the opposing robot is in its starting area, will be deemed to be intentional harm to an opponent and can lead to disqualification. o However, blocking other robots or pushing other robots while attempting to score will generally be considered legal. ● Robots will compete in a head-to-head competition. However, operation of the robot without an opponent will be an important part of the robot grade. Two Variable Voltage switches (0 to 5VDC) with a user-controlled knob to adjust the voltage. Each switch is Double Pole Double Throw (DPDT) switches, which can operate a DC motor in either direction. Note the kit contains five DC motors and one solenoid, but only four user-controlled switches. More than one electrical device can be connected to a single switch, but the voltage may drop if a large current draw is placed on the power supply. Use of motors, solenoids, and switches will be covered in lecture and is described in the course pack. ● No foamcore in final robot (as stated in kit parts list). ● The wire and string are “serve-yourself”, but are limited in length as noted. ● The paper cover on the acrylic parts is not to be used as a separate part. If it is detached from the acrylic, it must be discarded. ● Nuts, bolts, and washers included in the Design Studio bin. These include bolts from size 2 to size 10, and metric screws for mounting the motors. ● Only take nuts and bolts from the bin as you need them, and search through the spare bolt bin before taking more (we went through $1,500 in fasteners last year!). ● Adhesives; including hot melt glue, and acrylic adhesive. ● Tape used ONLY for electrical insulation. ● Lubricants used only to reduce friction within one's machine (not on the contest table). We have some extra material that can be used for experimentation. This material will be made available in the lab scrap bins. In addition, each section tutor has access to a limited amount of replacement material for their section. If you need replacement parts, contact your tutor. Some replacement of "mistakes" made to kit parts will be available, but supplies are limited, and replacement is not guaranteed. ● The combined volume of all 3D printed parts may not exceed 50 cubic inches per team. ● Individual prints must fit within a 4x4x4in cube. ● Team members must create the CAD files for all 3D printed parts, except for gears, timing belt pulleys, and selected parts that will be posted on the MAE3 webpage. ● Teams can experiment with 3D printing and parts that are not used on the robot will not count towards the team's total. However, priority to the 3D printer will go to students working during their section time and to teams which have not yet used to 3D printer as much. Use of the 3D printer may be heavy during the final weeks of the class, so do not count on readily available access at that point. The electrical connections will made to a single umbilical cord hung from above the table; one on each side of the table. The umbilical cord cannot be touched during the contest, and there will be some drag from the cable. Each machine must be designed to overcome this drag as needed for motion of the machine. If requested, a TA can ensure that the umbilical cable does not snag. The contest will be held during the MAE finals period and will be open to the public. The contest will be held in a single elimination fashion (like a tennis tournament). During the lab period of the last week of classes, each section will hold a section-wide contest. The results of this contest will be used to seed the placement of the final contest. Thus, teams that perform better during their section contest will have statistically easier contests in the early rounds. Since the number of teams in the class will not be exactly a power of 2, the higher seeded teams may get a "bye" during the first round. If necessary "wild card" teams will be selected to have a second chance in the contest, to ensure that all pyramid spots are filled. Operators may interact with their machine during a contest only through normal operation of the switch boxes (for example, you cannot touch the machine with one's hands during operation). It is allowable to adjust the configuration of the machine between contests; for example, adjusting the configuration to the side of the playing field the machine starts on. Gaining traction by use of adhesives, or by abrading or breaking the surface of the playing field is not allowed. However, it is permissible for a team to bolt a stationary robot to the table using the existing mounting points. Cable ties (zip ties) can only be used for strain relief. Hot glue cannot be used in the final robot! (okay for prototyping, risk reduction). Acrylic glue and super glue should be used only when necessary and should be avoided in the construction of structural elements. Excessive use of glue in the final robot will lead to reduced points on the final robot grade.